Here is a selective history of our recording releases starting with the latest and ending in early 1994 with our first 7". Click on the speakers or selected song titles for lo-res MP3 sound bites. All of our full-length LPs are now available on Itunes, at Insound.com and Amazon.com. 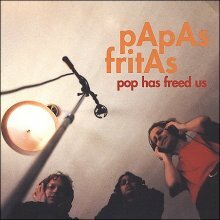 A retrospective album entitled Pop Has Freed Us was released in 2003 including all three Papas Fritas music videos on DVD, as well as our best-known singles, some early demo recordings, a newly penned track called “Love Just Don’t Quit” and a few cuts that didn’t make the various Papas Fritas albums for which they were recorded. Click on the album cover to buy Pop Has Freed Us on iTunes. Finally, we are back! Buildings and Grounds was released in the USA on March 7th through Minty Fresh Records, and also in France (Spirit), Benelux (62 TV), Japan (Rock Records Japan), Spain (Caroline Espana), The Philippines (Unviersal), and Australia (Half a Cow). The spiral is a different color in each continent. Click on the album cover to see the artwork in more detail. Our second LP on Minty Fresh (released April 22, 1997) -- Recorded in eight track analog at The Columnated Ruins, which was situated in the woods of Gloucester, MA, the fish-stick capital of the Western World (and also home of a spiritual vortex). The sound of this record is a direct result of our many experiences working together as a rock and roll BAND, and thus it has a very natural feel to it. If you're interested, check out this video clip of our historic, live appearance on MTV Oddville performing Hey Hey You Say. Has been out since Feb. 1994, and we're still not completely embarrassed by it. Our finest and LAST four-track production. (although we didn't stop trying) The band's live sound at the time was fully realized on this recording -- it's not "Rumours" or anything but we like it. This seven inch is important because once Matt Hanks (see figure 5.467b) released this record, we decided that we should act like a "real" band and start working (touring, promoting ourselves, learning how to sing, etc...) Nifty trivia: Smash This World is the song that got us noticed by Minty Fresh.